Grant Snider Does It Again! Big thanks to Barry Dempster, poet and editor, who posted this cartoon on Facebook today. 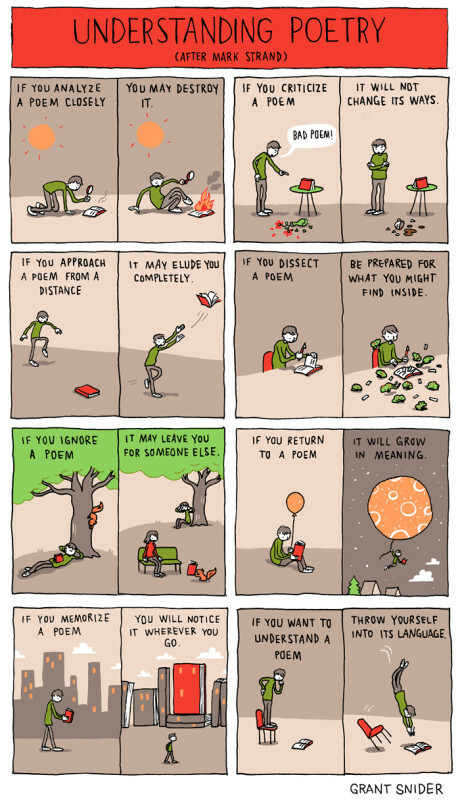 Another remarkable cartoon rendering of poetry by cartoonist Grant Snider! 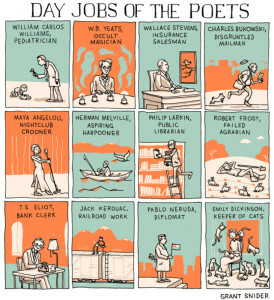 In 2013 his cartoon Day Jobs of the Poets also zoomed around the net! ( I have included this cartoon at the end of the post.) And this guy, last time I looked, was training to be a dentist!!! Maybe I could ask him to tattoo some of his poems on my teeth! or love a frog and never kiss it. And for an x-rated version here is a stunner by the celebrated Canadian poet, the late Gwendolyn MacEwan. For a definition of poetry this one takes the cake and any other metaphor (better than this one I hope) you can make up! I’m going to answer the Question right. The question is Why Do You Write. Don’t ask me I just work here. Poetry has nothing to do with poetry. The sound you make or don’t make when you die. and the difference in teeth. still lisp in the branches. Why do I want to imitate them? When I think of al the science on the elements formed by the death and collision of stars (the creation of iron, lead, gold and the like) I now will add, thanks to Stone, perhaps the most precious and heavy element of them all – words! Words that can describe a universe back to itself. This entry was written by Richard Osler, posted on April 11, 2014 at 3:47 pm, filed under Poetry and tagged Billy Collins, Grant Snider, Gwendolyn MacEwan, Richard Osler, Ruth Stone. Bookmark the permalink. Follow any comments here with the RSS feed for this post. Why do I write, what is a poem … these are the things I think all poets grapple with and try to write about at some point. Some poets don’t like poems on poetry but I treasure good ones!